Linda Mackenzie, 58, is not your normal psychic. She's aided the British government in paranormal research, the Los Angeles police department in homicide investigations, soothsaid for celebrities, corporations and politicians, appeared on ABC, Fox, NBC and KTLA-yet despite her list of overwhelming credentials has chosen to make her living as a telecom engineer and private consultant developing communications networks for Continental and Western Airlines. 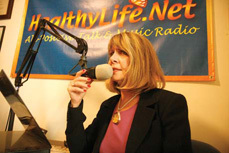 Then, in 2002, she started a Manhattan Beach based Internet radio station called Healthylife.net. Whether it was her work experience at reading the future or her skills as an engineer/business woman that made the station grow from 2,000 to 3 million listeners in just six years is not important, Mackenzie says. What's important is that her life-goal to inspire people with "positive energy" is working. "Everyone and everything gives off positive and negative frequencies," Mackenzie said. "To help more humans to live a positive life and emit positive frequencies is to help the planet. My station has allowed me to transmit this message like a lighthouse and reach over 28 million people since it's started." Healthylife.net is syndicated over 19 different Internet radio broadcasts throughout the United States and 103 other countries. Last year Windows Media Player picked up the station, boosting its listenership by 711 percent. "Every time someone opens Windows Media Player we're there," she said. "They picked us up for syndication because they recognized we were serving a niche market that people wanted." And according to Mackenzie that market is 24/7 "positive" talk radio. "We don't do sensationalism and we don't do controversy without presenting answers," Mackenzie said. Celebrities such as NBC's Steve Truitt, Academy Award nominated actress Sally Kirkland, and Dr. Jane Greer host segments on her station by calling in from around the world. In the basement of Mackenzie's home is a self-built studio able to record and decompress phone calls to improve sound, which are then transmitted into a computer editing bay for Internet broadcast. Before Mackenzie set out on her own, her previous radio experience included nearly a decade of hosting segments on shows where she would do free psychic readings. She has authored several books and filmed self-help videos espousing the philosophy that every human has the ability to control his or her energy field with enough practice, which, in part, is what she attributes her psychic abilities to.